Want to see the planters again this year? Big cities, small towns, school campuses and residential neighborhoods across the country understand the importance of beautification. Clean, lively streetscapes attract tourists, shoppers, and new residents, giving a boost to business, property values, and tax revenue. Beautification projects often include major improvements like sidewalk repair and new construction, and finishing touches like planters and tree lighting. One classic component of a neighborhood revitalization project is planted flowers and greenery. When added to sidewalks and public spaces, they turn ordinary features into eye-catching decorative elements. The success of this project is critically dependent on the support of generous contributions from local businesses and residents. We are hoping that you see the value of this program and are counting on your dedication and financial support in 2016. Your fully tax-deductable contribution will go to the Sponsor-a-Planter program through the Make Gahanna Yours 501(c)3 Foundation. Any donation will be appreciated. All donations will be acknowledged on our webpage. 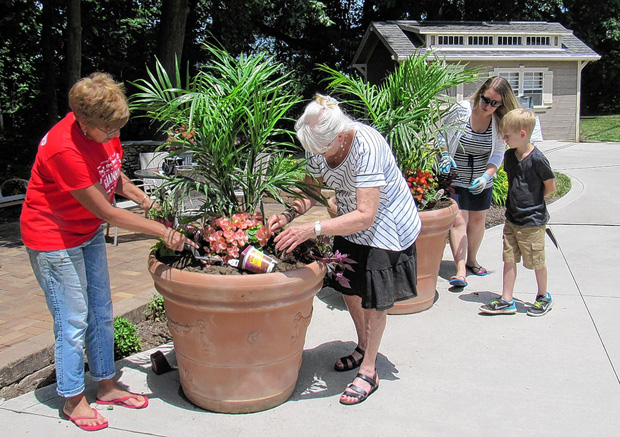 Make Gahanna Yours volunteers will plant, place and maintain large planters in Olde Gahanna. You can donate here to help our committee cover the cost of the planters. Donors will be recognized on the Make Gahanna Yours website and Facebook page. Show your Gahanna Pride All Year Long!